Ben Ashkenazy and Michael Alpert of Ashkenazy Acquisition are in contract to buy the ground under 625 Madison Ave. for roughly $400 million, according to sources. The deal extends the duo’s reach on Madison, where Ashkenazy owns the leasehold at No. 635, the retail condo rented to Barney’s at No. 660 and the retail condo occupied by Prada at No. 841. The pair also teamed on No. 711 and were partners with Carlyle at No. 650, which was sold this week to an investment group for $1.295 billion. The 17-story 625 Madison, leased to SL Green Realty Corp., was constructed in 1956 and renovated in 1988. SL Green’s operating lease ends in 41 years, in 2054, and the current $4.6 million rent has resets in 2022 and 2041. 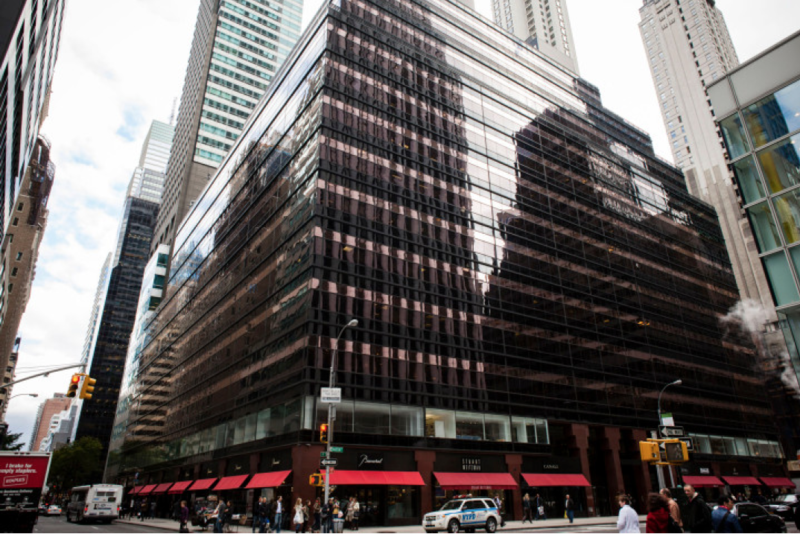 The building, previously Revlon’s headquarters, sits on the 200-foot long east side blockfront between East 58th and 59th streets, and it has another 200 feet of frontage along 59th and 150 feet on 58th running toward Park Avenue. The land Ashkenazy is buying is being sold by its longtime family owners, who hired the Cushman & Wakefield capital-markets team of Helen Hwang, Steve Kohn, Nat Rockett, Karen Wiedenmann and Sujohn Sarkar to pitch it round the world. Before Ashkenazy pounced, there was significant interest from major players, including institutions, real-estate investment trusts, sovereign wealth funds and high-net-worth families, market sources said. A hard contract was signed late last month, according to sources. Neither C&W nor Ashkenazy would comment. Polo Ralph Lauren occupies 70 percent of the office space, while the 30,500 square feet of retail is occupied by Lavo, Swarovski and Wolford, among others, with Canali joining them soon. The key to the high price is the rent reset in nine years, as the expectation is that it will leap to a whopping $50 million per year. That’s because the ground — known as the fee position — would be appraised as vacant land but improved to its highest and best use at that time, according to valuation experts. Imagine a roughly 563,000-square-foot slender skyscraper with Central Park views. With both retail rents and residential condo sales skyrocketing along with the slew of nearby luxury towers, the theoretical building would be worth more than $1 billion at just today’s values, or an average of $2,000 per foot. The marketing book for 625 Madison said the new lease payment would be 4.5 percent of the valuation, hence the $50 million rent. Reflecting city asset appreciation, nearby office sales include Sony’s headquarters at 550 Madison for $1.12 billion and 650 Madison at $1.295 billion. Superluxury condos are trading for $6,000 and $8,000 per foot, while retail condos are fetching $10,000 to $20,000 per foot, thus the $277 million sale of the retail at 680 Madison.